Do you have a pet peeve? I know I do. The image above illustrates one of them. In the apartment we are currently in, I often walk down the street and into a short pedestrian walkway or path. The street is a cul-de-sac and there are parking bays that are marked for cars to park on either side of the street. However, there is a section where the pavement / sidewalk is ramped. The ramp is supposed to be to enable anyone with any kind of mobility problem to navigate this transition from the path to the road with ease. It could be someone with a walker / walking frame. It could be someone with a stroller or shopping trolley. It could be someone in a wheelchair. 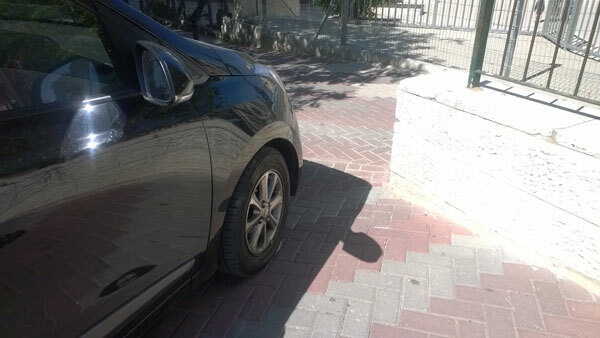 But most of the time some or other car is blocking the ramp. Today I decided to do a blog post with images of what is happening here. Notice that there are actually two cars involved here today. 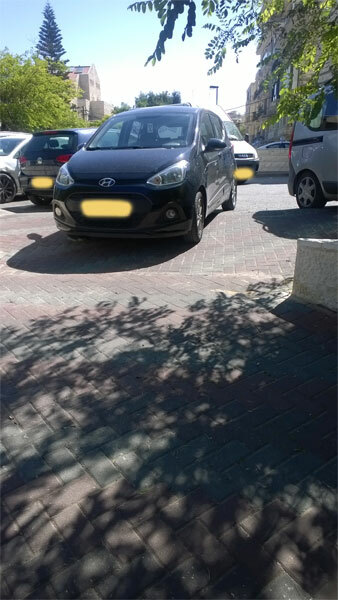 This section of the pavement / walkway is supposed to remain clear for pedestrians in general and those with any kind of special need in particular. The selfish drivers have not only blocked the ramp but parked right up on the pavement too. Notice how little space is left between the corner of the car and the low wall the supports a fence.If one is thin and able-bodied, you can of course get through. But what about someone who is larger in size and build? What about someone in a wheelchair? What about someone with a double stroller? There is no way for them to get through at all. Here you can see the path for pedestrians that connects this cul-de-sac to the adjacent street. Take a look at just how far the car has extended onto the section that is for people to walk, not for cars at all. If you take a look from the other end, it might make more sense as to what is happening. I get really upset to see this kind of parking. It shows total and utter disrespect for everyone, other than the driver of the cars that have parked so badly. 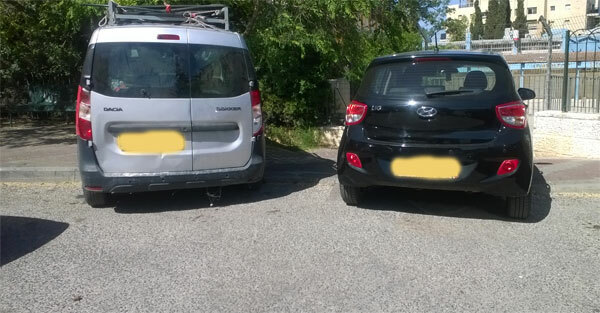 Today the problem is illustrated with these two cars. However, sadly, every day we see something like this. A car that could park in a parking bay a minute or two walk down the street. What would be so bad about them walking two steps or a few? I should have photographed the empty parking bays behind. There are always vacant bays a tad further down the street. It would really only take about 10 steps or so to see the empty bays. Not a problem for anyone who can walk to walk a few steps or even a hundred steps and leave the area where the ramp is free and open for those who require use of the ramp. 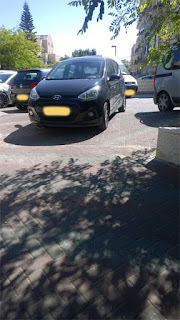 If you take a good look at the cars, they do not have any disabled parking disc, so there is no reason to think they might have need for the ramp, or to be as close as possible to the school. In truth, if they had a disability, they most probably would need to use that ramp and therefore would not be parked over it. If you are old enough to be driving, you are old enough to think about the needs of others. Please respect those who need to make use of ramps and park in the bays that are allocated for cars. Baffled, flabbergasted by the inconsiderate behaviour of the modern driver. Please think of the needs of others. Someone who needs a wheelchair for mobility has a right for the ramps to be left free for them to use when they need it. Author of "Healing Your Life Through Activity"
I have seen this often. 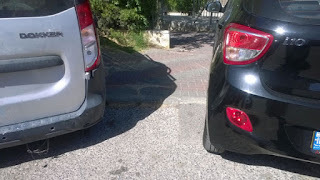 Sometimes the cars have been parked there even closer together, effectively blocking off the entrance to that short walkway. It is a much longer walk around quite a long block if one cannot get through.